Farfugium japonicum var. giganteum is the name, but sometimes you see these plants called Ligularia or leopard plant. Growing in zones 6-10, Farfugiums grows on thick stalks about a foot and a half to two feet tall. Our’s started off at about a foot tall and has since grown to the promised two feet or so. We have it in a medium size composite pot. The leaves are anywhere from four to ten inches across. 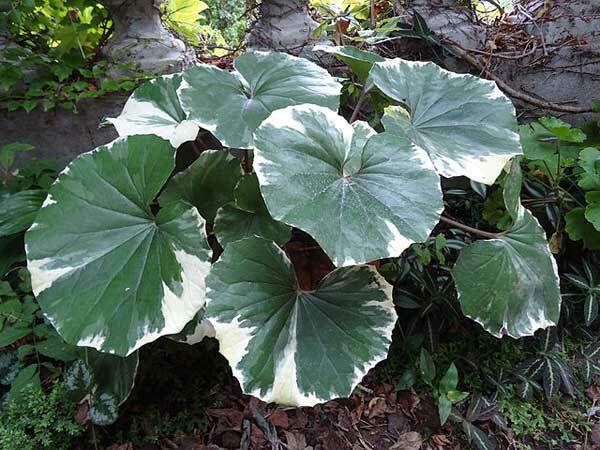 And, from what I understand, the creamy colored spots on the leaves that give the name “leopard plant” to this herbaceous perennial disappear in the warmer zones of 8-10. This particular Farfugium japonicum has proven that to be true. With solid deep green leaves, there are no signs of the yellow spots. 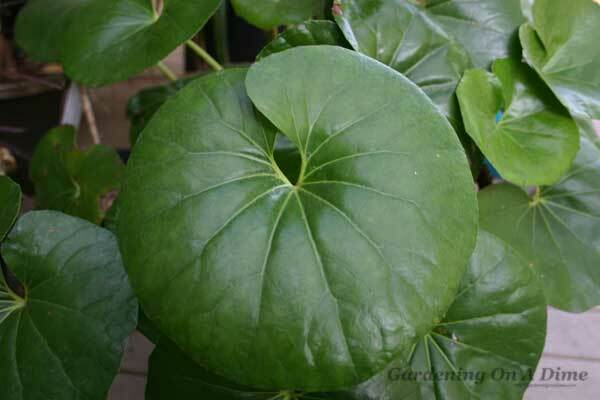 We picked up this plant solely because of it’s resemblance to a lily pad. Sitting on a shelf at the nursery with other plants, I thought, how cool is this? 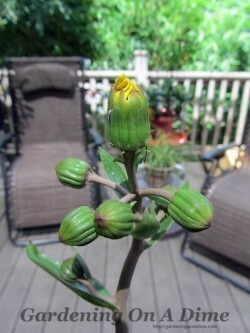 A plant that looks like in should be in a pond that we can enjoy on the deck. Though it flowers in the cooler months between November and January, it seems to take forever for the flower stalk to grow and develop. Then another forever for the flowers to open. However, once open, they can last quite a while. 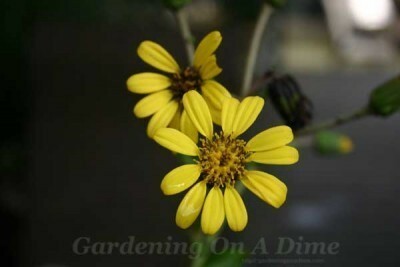 Most of the yellow flowers are about two to three inches in diameter. They look very nice in clusters of 5 or 6 per stem. Farfugiums will not take the cold. Those big leaves cannot handle the cold winds. If you plant them in the ground, you can cut the stems off to the ground and cover them with mulch. However, even that it no guarantee that in really cold conditions as they might die from freezing….or come back from the ground in spring. Put some plants in a container or two. Keep them in moist humus rich soil and feed them LIGHTLY with a good fertilizer. Then you can move them to shelter when winter temperatures drop. Now, if you are fortunate to be growing them in zones 8 and 9, you are in luck because that is where they thrive the best. Even in those zones, though, you need to not toast those big green leaves with too much sun. Our potted plant sits on a deck that has shade cloth over it. The shade cloth cuts out about 85% of the suns intense summer rays and we have to keep it watered well to prevent the leaves from wilting. Other than the temperature issues, this plant is pretty maintenance free. I could see planting a mass of these in a shady area of the garden. Perhaps a few clusters of variegated spider plants in front and you would have quite a nice patch different textures. 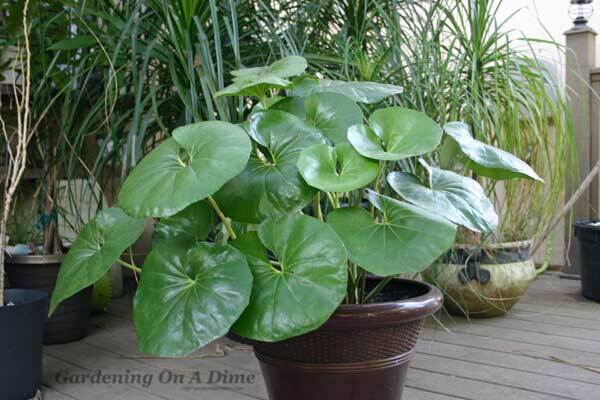 Or do like us and plant a Farfugium japonicum in a nice pot, next to a decorative water fountain and imagine a little that you are growing water lilies on your deck. P.S. While researching this plant I found a nice book with good ideas for making your shady gardens brighter and more attractive. 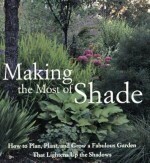 It’s called: Making the Most of Shade: How to Plan, Plant, and Grow a Fabulous Garden that Lightens up the Shadows by Larry Hodgson, available at Amazon.